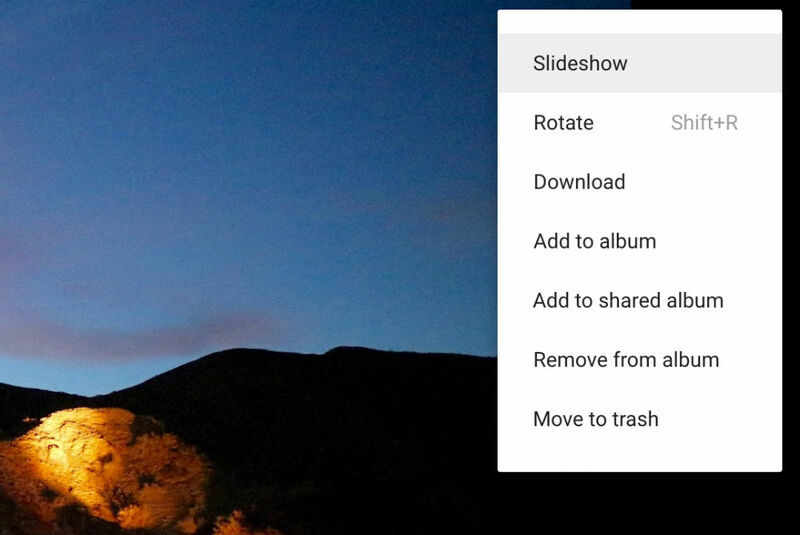 Slideshows are now available through Google Photos within individual albums. To get started, open up the Google Photos app, go inside of an album then select a photo you want to start the slideshow with. Once you hit the three-dot settings button, the top option will be Slideshow. Once tapped, a slideshow of the photos will begin. If you wish to project your slideshow to your HDTV, you can simply cast the show via Chromecast or Android TV. And yes, the Slideshow feature is available on your desktop computer, too. Unfortunately, the feature is limited to just that, a Slideshow. There are no randomizing effects, no stoppage of duplicate photos being shown, or anything quite unique about it. The Slideshow simply shows whatever is in that album, just as you have it. If you want to make a better Slideshow, you will need to move photos around and edit them on your own. The option should be live for all in the Google Photos app. Go check it out.